Welcome to the world of Panasonic digital imaging platforms where digital communications and imaging technology converge. Empowering your business with more versatility, higher reliability, greater ease of use and expanded network connectivity, Panasonic copier/printers are the "office power tool" for your business, and the DP-8016P is no exception. Combining printer and copier functions in a single platform with ledger-size capability, the DP-8016P provides a practical, cost effective solution for office document processing. The standard 10/100 Ethernet interface allows the DP-8016P to serve as a network printer right out of the box. By moving the output tray inside and eliminating protruding paper trays, the DP-8016Ps small footprint saves valuable office space. This compact wingless design enables installation anywhere, even on a small desktop. When connected to your office LAN via the standard 10Base-T/100Base-TX Ethernet interface, the DP-8016P serves as a high-speed, high-quality laser printer capable of handling documents up to ledger (11x17) size. Even while performing at a quick 16ppm (letter size), the printer maintains crisp 1,200 dpi equivalent x 600 dpi image quality. This standard connectivity will allow all the PCs on your LAN to take advantage of the printing capabilities and cost savings provided by the Workio DP-8016P. When connecting to an individual PC, a standard USB interface is available. 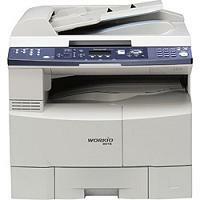 To top it all off, the DP-8016P has a variety of business friendly functions such as Poster Mode, and N-in-1 Print. The Device Monitor allows you to check the current status of the DP-8016P without leaving your desk. When the Toner is low or the paper tray is empty, Users can respond immediately especially when trying to meet an important deadline. The DP-8016P copies at a quick 16ppm with crisp 600dpi quality, provides ledger-size input and output, and improves efficiency with double exposure, 2-in-1 copying, Digital SkyShot and Image Rotation. An Automatic Document Feeder (ADF) is available as an option to accelerate copying of multi-page originals. And with standard electronic sorting, you wont have to hand-sort those larger copy jobs. In addition to 600x600 DPI resolution and a 256 level gray scale, the DP-8016P consistently provides optimum image quality by constantly monitoring and adjusting for room temperature and humidity conditions. By Selecting the Double Exposure function, users can make quality copies of double-sided documents on a single sheet of paper without the black borders, even if the platen cover is open. This is especially convenient for copying small double-sided originals such as ID and insurance cards, checks, and receipts. User authentication not only bolsters security and ease of administration by using the same user names and passwords registered in your Windows Active Director server databasae, but is also enables the setting of usage restriction on printing and copying for more efficient cost management and control. The Mailbox features gives users the chance to store print jobs at the device. This way, users are able to print documentation at a later time to help keep their print job separate from everyone elses. Confidential documents can be temporarily stored in the secure mailbox. Users enter their passwords to safely print out the documents at any time they choose.